Bundle last week and could not wait to use it. 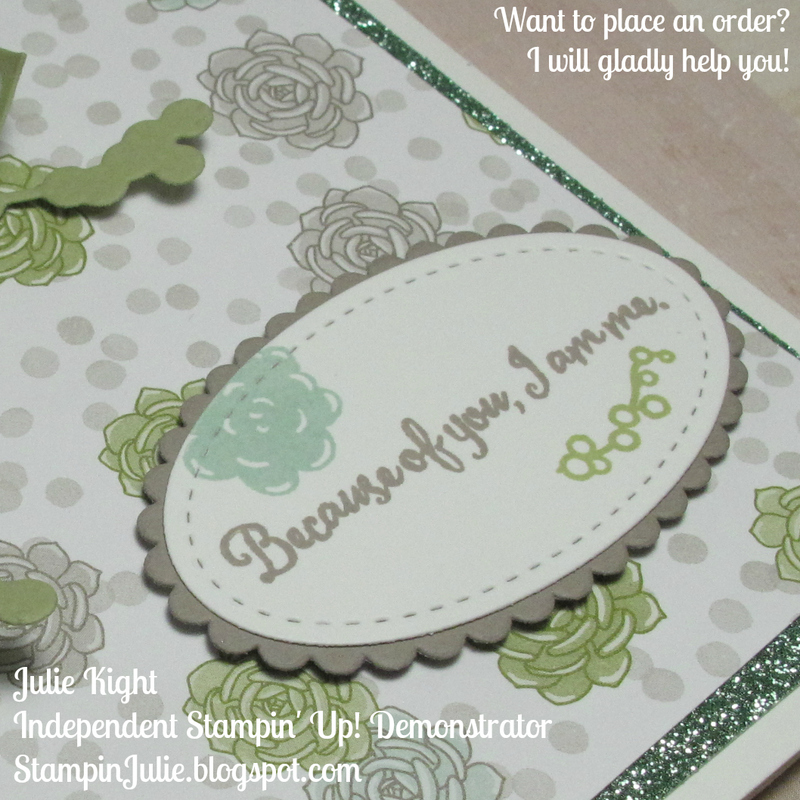 The DSP is some of the most beautiful paper I have seen with Stampin' Up!. At first I wasn't to keen on getting it. Then I started seeing demonstrators using it and I just fell in love. Doesn't always happen! 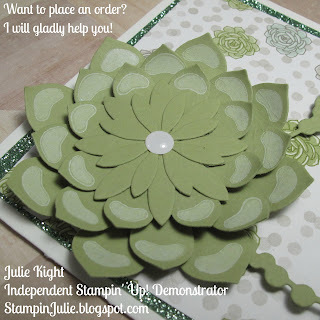 I started with a A2 sized card base made of Whisper White cardstock. 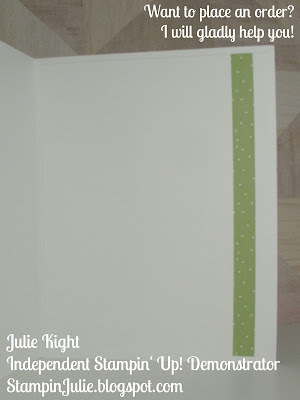 Next, I cut a piece of the Glimmer paper in Mint Macaron to 4"x 5-1/4" and glued it onto the card base. Then, I cut a piece of the beautiful Succulent Garden DSP to 3-3/4"x 5" and glued it down to the Glimmer paper at an angle, something different. dry. It is not like the regular dye inks that dry very quickly. You can also use the Heat Gun to speed up the process. I recommend using it on the lowest setting. 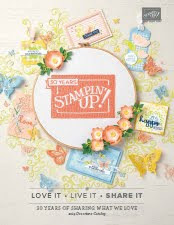 Next, I didn't want the pieces to just be glued together and look all smashed, so for the two bottom layers I put a Stampin' Dimensional between them. The top two layers are just glued together regularly. 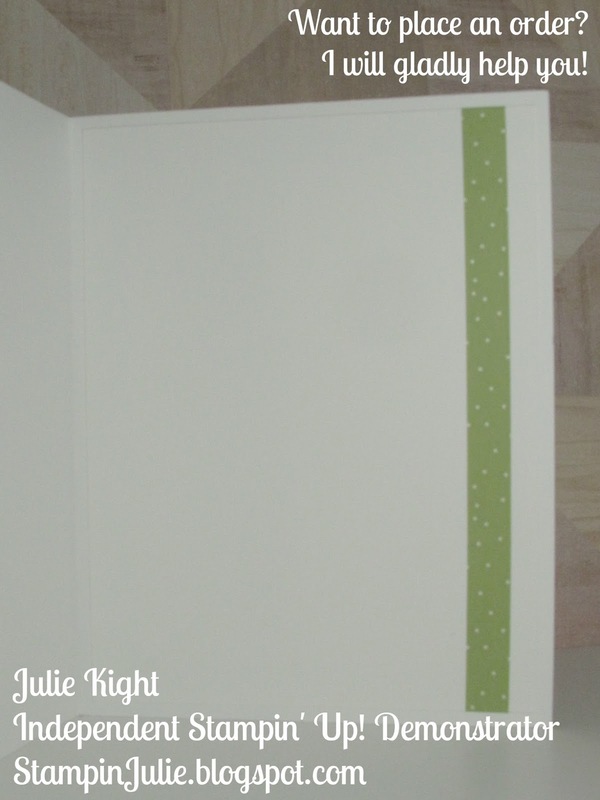 Finally, I place a White Perfect Accent in the middle and glued the whole thing down onto the card in the upper left corner. going to be sad about seeing go away in a few months, and die cut it out with the Stitched Shapes Framelits in the second from the smallest ovals. I then got some Tip Top Taupe cardstock and die cut a piece using the Layering Ovals Framelits in one of the scalloped ovals just slightly bigger then the Stitched one and glued it to the back of my sentiment. 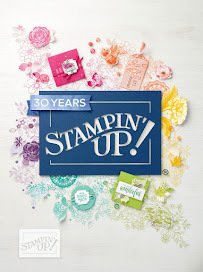 I then used the Oh So Succulent stamp set again and stamped a couple of smaller stamps around the sentiment in Mint Macaron and Pear Pizzazz. 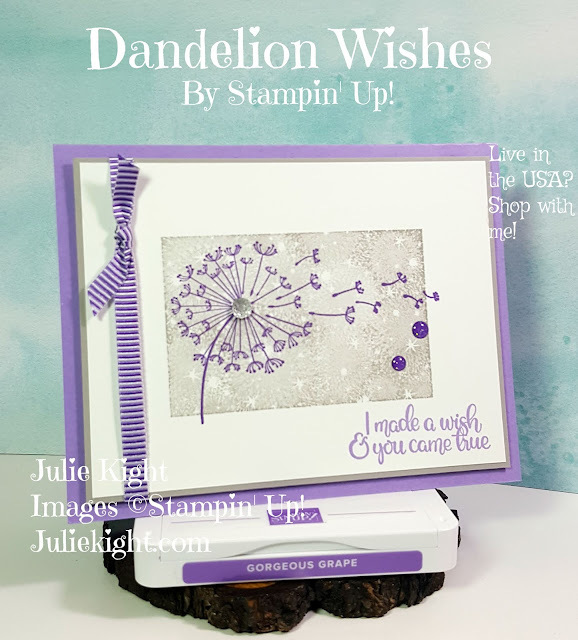 I grabbed out my Basic Rhinestones and placed three of them around the sentiment, and placed Stampin' Dimensionals on the back and placed in on my card. piece of Tasty Treats Washi tape in Pear Pizzazz and wrapped it around and then glued the whole piece onto the inside of my card. And there we go! Finally finished. 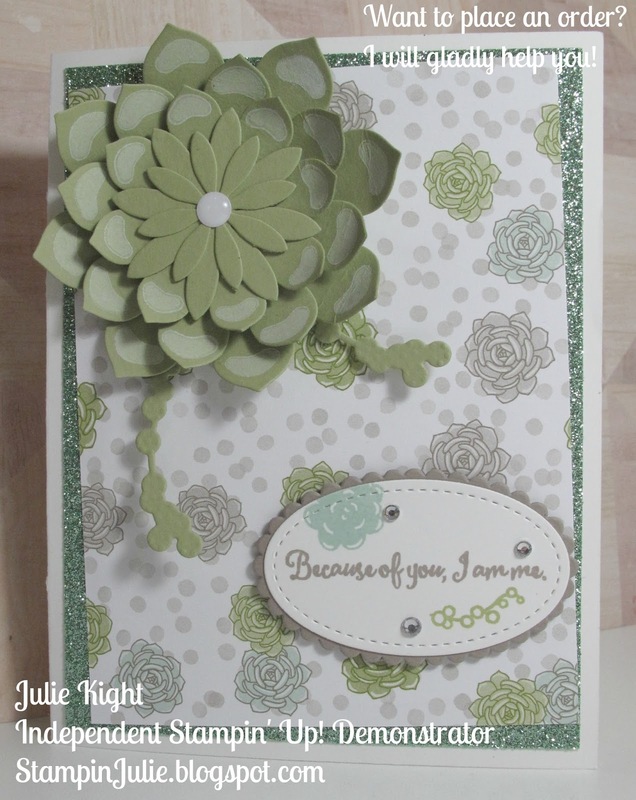 This card turned out way more beautiful then I had originally imagined. I have just fallen in love with this Suite from the Occasions catalog. If you have any inkling of wanting to get this bundle then I suggest definitely getting it! 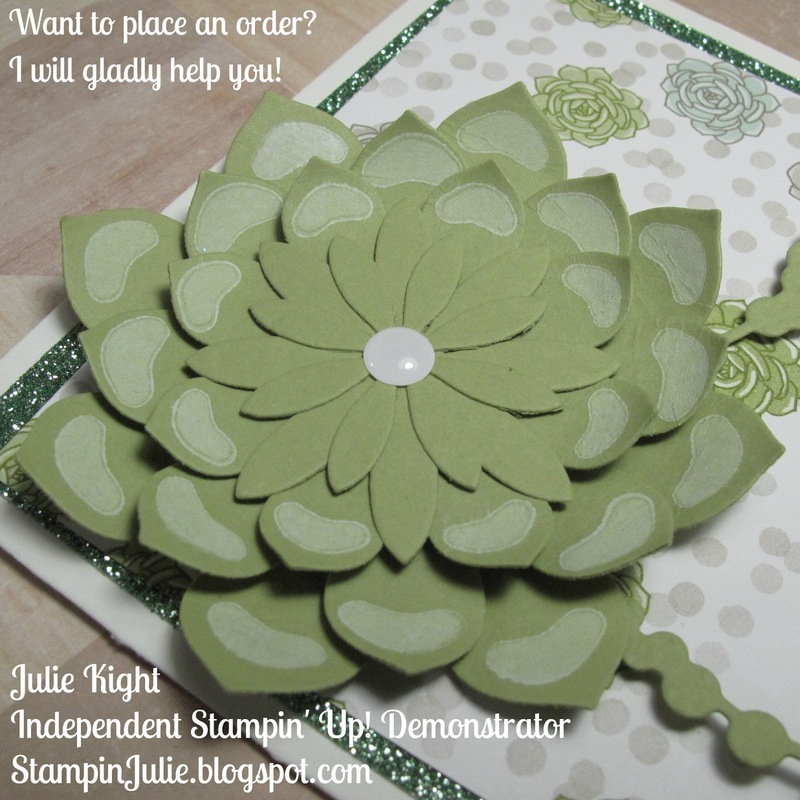 Thank you so much for coming to my blog today and checking out my succulent card post. I have so much fun making all my projects and find great joy in it as well and I love sharing what I make with all of you. 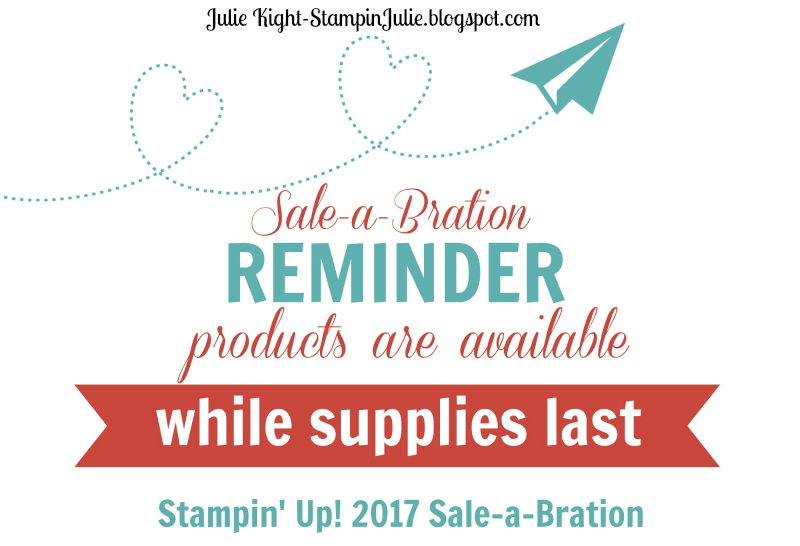 Only 16 days left for Sale-a-Bration!